"Here on the morning of October 21, 1864 General Marmaduke's Confederate forces attacked Union troops under Colonel Moonlight drawn up on the hill to the west. Federal resistance was fierce until 10 A.M. When General Shelby's Confederate cavalry moving up on the main road caused Moonlight to fall back to Independence." Directions to Historical Marker A: Marker A is located on the westbound side of US Highway 24 just east of the Little Blue River. Take US Hwy 24 east from Independence. 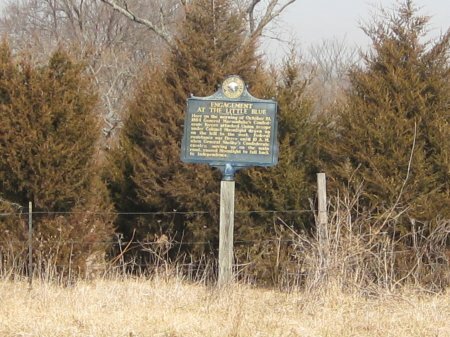 The marker is about 6.5 miles east of the intersection of US Hwy 24 and State Hwy 291. US Hwy 24 is a divided highway, but there is a place to make a U-turn right after you cross the Little Blue River. Be careful for US Hwy 24 is very busy with vehicles moving at high rates of speed. 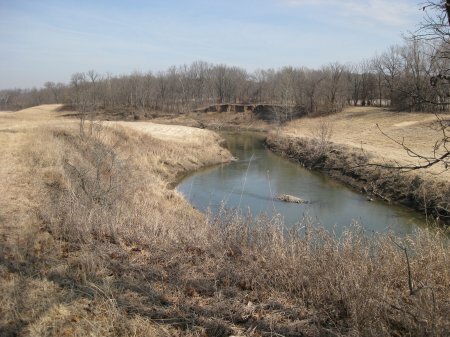 This tour stop is located near Independence, Missouri 64056. Description: Blunt had left Moonlight with about 400 cavalrymen and a battery of four howitzers. This marker is located at the center of where fighting took place on the morning of October 21st. The river was shallow in many places which made it difficult to defend. Moonlight had put his advance pickets about a mile east of where you are standing and was waiting for the arrival of Price's army. Confederate General Marmaduke's attack began around 7:00 AM and rapidly pressed Moonlight's troops back across the river. The Confederate attack stalled at the east bank of the river due to heavy fire from Moonlight's four howitzer battery. You will get a better look at where this battery was placed at the next historical marker.